Serum hepatocyte growth factor (HGF) is rapidly increased in patients suffering from various tissue injuries including arterial occlusive diseases. However, the cellular sources of the HGF increase remain largely unknown. In the present study, we showed that bioactive mature HGF is constitutively present on the surface of granulocytes in human peripheral blood. Exogenously added 125I-labeled iodo-HGF efficiently bound to granulocyte surface, whereas only a scarce amount of HGF mRNA was detected in granulocytes, indicating that the mature HGF on granulocytes is likely to be derived from other cell types. Interestingly, treatment of granulocytes with human serum rapidly induced the release of the cell surface-associated HGF. In vivo, thromboplastin injection into mice increased HGF release from transplanted human granulocytes, which was inhibited by the pretreatment with DX9065a, a specific inhibitor of factor Xa. Furthermore, DX9065a also inhibited the serum-induced HGF release from human granulocytes in vitro, suggesting that the HGF-releasing factor(s) in serum is associated with factor Xa activation. Thus, human granulocytes may function as a transporter of HGF in the peripheral blood, releasing HGF at the injured sites caused by blood coagulation, where HGF may promote tissue repair. Hepatocyte growth factor (HGF),3 also known as scatter factor, is a pleiotropic growth factor that regulates development and wound healing (1, 2, 3, 4, 5, 6). Mesenchymal cells produce HGF in response to cytokines such as IL-1 and TNF-α, which are released during tissue injuries (7, 8, 9). HGF stimulates the growth of epithelial cells and induces angiogenesis to promote tubulogenesis by endothelial cells (10), thus playing a pivotal role in tissue injury repair. Exogenous administration of HGF may be useful in the treatment of certain diseases (3). Especially, because it induces angiogenesis, HGF may be useful for the treatment of chronic ischemic diseases or acute myocardial infarction (11). Serum HGF levels are elevated in a number of diseases, such as hepatitis, pneumonitis, pancreatitis, and cancer (12, 13, 14, 15, 16, 17). The source of the elevated serum levels of HGF in these disorders is presumed to be increased production of HGF by inflamed organs or cancers. HGF levels are also acutely elevated in cardiovascular diseases such as unstable angina, acute myocardial infarction, peripheral arterial occlusive diseases, and ischemia/reperfusion cardiac injury (18, 19, 20, 21, 22). As serum levels of HGF peak within 3 h of the vascular events, long before the peak of HGF mRNA, the increased serum HGF is probably derived from the previously synthesized pools (19). HGF is secreted as an inactive single chain precursor (pro-HGF) and then activated into a heterodimeric active form (mature HGF) by serine proteases (6). Recently, neutrophils have been shown to store pro-HGF in granules and secrete mature HGF converted from proform by degranulation (23, 24). In this study, our findings indicate that a significant amount of mature HGF constitutively exist on the cell surface of human granulocytes circulating in the peripheral blood. The cell surface-associated HGF is rapidly released with the stimulation by serum, but not by plasma, suggesting that the release is associated with blood coagulation. Use of specific inhibitors of coagulation factors indicated that factor Xa (fXa) in serum played an important role in the HGF release from granulocytes. Because thrombosis is generally involved in occlusion of peripheral vessels, these data suggest that granulocytes may play an important role in the response to tissue impairment by delivering HGF to the injured sites, which then initiates the process of tissue repair. Whole blood, plasma, and serum samples were obtained from healthy volunteers. Informed consent was obtained from each volunteer after the risks and benefits of the studies were fully explained. Diethylammonium (Z)-1-(N,N-diethylamino)diazen-1-ium-1,2-diolate (DEA-NONOate) and disodium (E)-1-sulfonatodiazen-1-ium-1,2-diolate (Sulfo-NONOate) were purchased from Cayman Chemical. Heparitinase I and II, chondroitinase ABC was obtained from Seikagaku. Bovine fXa, PMA, and fMLP were obtained from Sigma-Aldrich. DX9065a was provided by Daiichi Pharmaceutical. Recombinant human HGF and HGF activator (HGFA) were given by Mitsubishi Pharma. Bovine prothrombin and factor Va (fVa) were from Hematologic Technologies. Antithrombin was from Chromogenix Instrumentation Laboratory. Thromboplastin was from Dade Behring. Other materials used in this study were described previously (25, 26, 27). Human gingival fibroblasts (MM cells), supplied by Dr. H. Takada (Department of Oral Bacteriology, Tohoku University Dental School, Tohoku, Japan) (28), were passaged 12 times to prepare MM-12 cells. MM-12 cells were cultured in DMEM containing 10% FCS until confluence; cells were then cultured for 48 h in the same medium. HGF level in the conditioned medium was 80 pg/ml HGF. Fibroblasts from human dental pulp were prepared as previously described (26) and cultured in DMEM containing 10% FCS until confluence. IM-9 cell, a human lymphoblast-like cell line, and HUVECs were purchased from Dainippon Pharmaceutical. IM-9 and HUVECs were cultured in 10% FCS-containing RPMI 1640 and in DMEM containing 10% FCS and 10 ng/ml fibroblast growth factor, respectively. Whole blood treated with 10 mM EDTA was obtained from normal human subjects and incubated with various concentrations of FCS at 37°C. After centrifugation at 20,000 × g for 5 min, the supernatant was diluted 4-fold with sample buffer for ELISA (12), and HGF concentration was determined by highly sensitive sandwich ELISA as described previously (25). Mononuclear cells and platelets from human peripheral blood were isolated by a method modified from Kanof and Smith (29). Granulocytes and erythrocytes were isolated by a method modified from Harlan et al. (30). Mononuclear cells, platelets, and erythrocytes were incubated in RPMI 1640 containing 10% FCS at 37°C. Granulocytes were incubated in RPMI 1640 containing various concentration of FCS, 10% human serum or 10% plasma at 37°C. Aliquots of treated cells were centrifuged at 20,000 × g for 2 min. Concentrations of HGF in the supernatants were determined by high sensitivity ELISA (25). Human granulocytes (8.4 × 106 cells) were incubated in 90% FCS or 50% FCS-containing RPMI 1640 for 1.5 h. HUVECs were stimulated with the granulocyte supernatant or 10 ng/ml HGF in RPMI 1640 containing 50 or 90% FCS for 10 h after preincubation in DMEM containing 1% FCS for 24 h.
Total RNA from human granulocytes, mononuclear cells, gingival fibroblasts, or HUVECs was converted to the first-strand cDNA by reverse transcription as described previously (26). Quantitative real-time PCR for HGF, thymosin β4 (Tβ4), and GAPDH was performed by using SYBR Green PCR Master Mix and a sequence detection system (model Prism 7700; Applied Biosystems) following manufacturer’s instructions. The human Tβ4 primers were designed based on the nucleotide sequence in a database (NCBI accession number: BC022857): the sense primer AAAATCCACTGCCTTCCAAA (position 156–157) and the antisense primer CACTTCTTCCTTCACCAACA (position 433–452). The human HGF primers were designed as described previously (26). The PCR for Tβ4 was performed and fluorescent signals were measured in real time under the following conditions: 95°C for 15 min, 40 cycles at 95°C for 30 s, 54°C for 30 s, and 72°C for 30 s. The fluorescent signal was expressed as the number of cycles required to achieve fluorescence at threshold. To normalize the amount of total RNA added to each reaction, GAPDH was used as an internal control. Total RNA extraction from human cells and RT-PCR for HGF and c-met were performed as described previously (26). Human granulocytes (2.0 × 107 cells) were incubated in 90% FCS containing RPMI 1640 in the presence of 20 μg/ml leupeptin, and HGF in the medium was partially purified with Heparin-Sepharose CL-6B (Amersham Biosciences) as described previously (31). Elution from Heparin-Sepharose CL 6B column (13 × 16 mm) was separated by SDS-PAGE and analyzed by Western blot with the anti-HGF polyclonal or mAb (25). FCS containing 2 ng/ml recombinant human HGF was also applied to Heparin-Sepharose CL-6B column, and then the elution was analyzed as a positive control. A total of 5 × 107 human granulocytes in 2.5 ml of PBS(−)-containing protease inhibitors (Roche) were treated by three freeze and thaw cycles. After removal cell debris by centrifuge at 600 × g for 5 min, plasma membrane was isolated from the supernatants by sucrose gradient centrifugation (32). 5′-Nucleotidase activity was measured to confirm the isolation of plasma membrane fraction (33). The remainders were collected as a nonmembranous fraction. Each fraction was concentrated down to 50 μl, 20 μl of which was separated by SDS-PAGE under the reducing or nonreducing condition, and then HGF was detected by immunoblotting with monoclonal or polyclonal anti-HGF Ab. The anti-HGF polyclonal Ab was exclusively specific to the mature HGF (heterodimeric form) (25), whereas the anti-HGF mAb possesses reactivity with both pro-HGF and the H chain of mature HGF (27), Western blot was performed as described previously (25, 27). For flow cytometric analysis of cell surface HGF, mononuclear cells (5.1 × 106 cells/ml) and granulocytes (2.6 × 106 cells/ml) prepared as above were incubated in PBS− containing 20 μg/ml rabbit anti-HGF Ab or rabbit IgG for 30 min at 25°C and washed with PBS(−) three times. The cells were then incubated in FITC-labeled goat anti-rabbit IgG Ab diluted 500-fold with PBS(−) for 30 min at 25°C. After fixation with 1% paraformaldehyde in PBS(−), the cells were analyzed by flow cytometry (FACScan; BD Biosciences). In each analysis, 10,000 events were recorded. For the microscopic analyses, mononuclear cells (5.1 × 106 cells/ml) and granulocytes (2.6 × 106 cells/ml)were incubated with rabbit anti-HGF polyclonal Ab for 1 h at 4°C, and then wash with PBS(−). As a control, cells were incubated with 25 μg/ml rabbit IgG. Cells were incubated with Alexa 568-conjugated goat anti-rabbit IgG (Invitrogen Life Technologies) for fluorescence microscopic analysis or Alexa 488-conjugated anti-rabbit IgG for confocal microscopy. After 1% paraformaldehyde fixation, fluorescence in cells were visualized using the fluorescence microscopy (model Labophoto-2; Nikon), or LSM410 confocal laser scanning unit coupled to an Axiovert 135M inverted microscope (Carl Zeiss). rHGF was purified with Heparin-Sepharose CL-6B column, and labeled with 125I-labeled iodine by the method of Hunter and Greenwood (34) as described previously (34, 35). The 125I-labeled iodo-HGF had a specific activity of 4.2 × 106 cpm/pM. A total of 4.3 × 105 cells of both human granulocytes and mononuclear cells were incubated at 37°C with 125I-labeled iodo-HGF in PBS(−) containing 1% BSA in the presence of 1 kU/ml superoxide dismutase, which was able to prevent neutrophils from apoptosis (36). After washing twice with 0.3% BSA in PBS(−) and twice with PBS(−) alone, the radioactivity associated with the cells was measured with an Autowell γ system as previously described (35). Male ddy mice (7 wk of age) were s.c. injected with DX9065a, a specific inhibitor of fXa, at a dose of 30 mg/kg or PBS(−), 30 min before the i.v. injection of thromboplastin at a dose of 40 mg/kg or PBS(−) from tail vein. After the injection of thromboplastin, human granulocytes (1 × 107 cells/kg of mice weight) were transplanted into the mice at 2 h, and blood was withdrawn with sodium citrate from the mice to prepare plasma at 3.5 h. Human HGF concentration in the plasma was measured by high-sensitive ELISA. Above operative treatments for the mice were performed under ether anesthesia. Statistical analysis was performed using the Student t test for unpaired samples. While measuring the concentrations of HGF in the whole blood of normal human subjects, we accidentally found that the addition of FCS increased the mature HGF levels in a dose- and time-dependent manner (Fig. 1⇓, A and B). As our HGF ELISA system only detects mature HGF but not pro-HGF (25), we incubated the plasma from the same human subjects with FCS to rule out the possibility that the observed HGF increase was simply due to the HGF-activating protease activity in FCS (37). The plasma mature HGF levels were not elevated by the addition of FCS (data not shown), indicating that FCS induced the release of mature HGF from peripheral blood cells. HGF released from human peripheral blood cells. A, Whole human blood was incubated with 0, 1, 3, 10, or 30% FCS for 1 h, and the HGF concentration in the culture supernatant was measured by ELISA. B, Whole human blood was mixed with 30%FCS (•) or PBS(−) (○) and incubated at 37°C for indicated times, and the concentrations of HGF in the supernatant were determined by ELISA (n = 3 ± SD). C, Human granulocytes (2.4 × 106 cells/ml) (•), mononuclear cells (4.4 × 106 cells/ml) (▴), platelets (4.8 × 107 cells/ml) (○), and human erythrocytes (1.1 × 108 cells/ml) (□) were incubated with 10% FCS for increasing times, and the amount of released HGF was measured as above. D, Human granulocytes (•) or mononuclear cells (▴) were incubated with 10% FCS for 90 min, and the amount of released HGF was measured by an ELISA. E, Human granulocytes (1.5 × 106 cells/ml) were incubated with increasing concentrations of FCS for 1.5 h, and the amount of released HGF was measured as above (n = 3 ± SD). To identify the cellular sources of the released HGF, we isolated platelets, erythrocytes, mononuclear cells and granulocytes from normal human peripheral blood, and incubated them in RPMI 1640 containing 10% FCS for 1.5 h at 37°C. As shown in Fig. 1⇑C, granulocytes released much higher levels of HGF than the other blood cells. We then carefully adjusted the cell numbers of granulocytes and mononuclear cells and compared the HGF release from the two cell types (Fig. 1⇑D). Granulocytes released ∼15-fold more mature HGF than the same number of mononuclear cells in response to FCS stimulation. 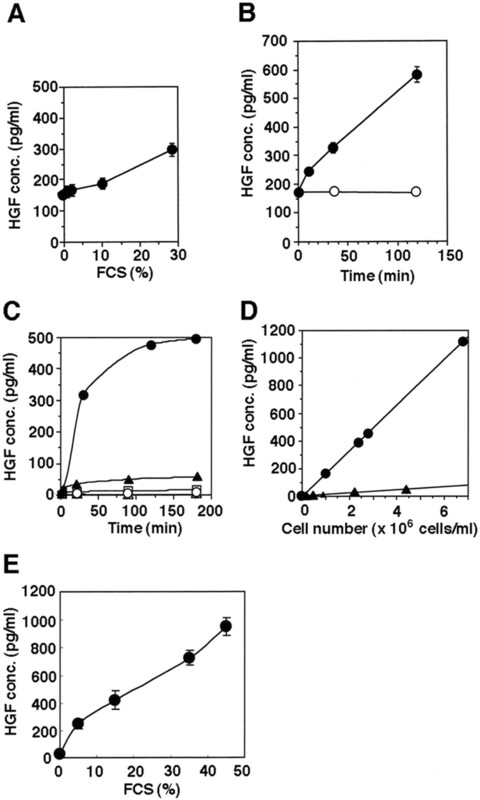 The mature HGF release from granulocytes was induced by FCS in a dose-dependent manner (Fig. 1⇑E). The biological activity of HGF released from granulocytes was confirmed by the induction of Tβ4, a responsive gene to HGF (38), in HUVECs (Table I⇓). These results indicate that granulocytes are predominant HGF-releasing cells in peripheral blood in response to FCS. Biologically inactive pro-HGF is converted to biologically active mature HGF by serine proteases in serum such as HGFA (6). We next explored whether granulocytes released mature-HGF or pro-HGF that was further converted to mature HGF by the serine proteases in serum. To detect pro-HGF in the conditioned medium of granulocytes, we incubated the serum free-conditioned medium of granulocytes with serum or HGFA and measured the increase of the mature HGF concentration. However, neither serum nor HGFA increase mature HGF concentration, indicating there was no measurable pro-HGF in the conditioned medium (Fig. 2⇓A). In addition, HGFA alone did not increase HGF release from granulocytes (data not shown). We then performed Western blot analysis of partially purified HGF from culture medium of serum-stimulated granulocytes in the presence of leupeptin, which inhibits the protease-mediated conversion of pro-HGF to mature HGF (27). The H chain of HGF (60 kDa) in the medium was detected by immunoblotting with anti-HGF mAb under reducing condition, but not pro-HGF (90 kDa) (Fig. 2⇓B). Taken together, it was suggested that granulocytes release the mature form of HGF in response to serum. Presence of mature HGF on granulocyte surface. A, Human granulocytes (4.0 × 105 cells/ml) were incubated in RPMI 1640, or 10% FCS-containing RPMI 1640 for 60 min at 37°C. The serum free-conditioned medium was incubated with PBS(−), 10% serum, or 5 μg/ml HGFA for 90 min at 37°C. The concentrations of HGF in the medium were determined by ELISA (n = 3 ± SD). B, Western blot of mature HGF released from human granulocytes. Recombinant human HGF in FCS (lanes 1 and 3), and HGF released from 2 × 107 granulocytes (lanes 2 and 4) in the presence of 20 μg/ml leupeptin were subjected to a Heparin-Sepharose column. Partially purified HGF with the column was detected by Western blot with rabbit anti-HGF polyclonal Ab (specific to mature-HGF) under nonreducing condition (lanes 1 and 2) or mouse anti-HGF mAb (specific to H chain of HGF) under reducing condition (lanes 3 and 4). ▵, Heterodimeric mature HGF; ▴, the H chain of HGF. C, Total RNA extracted from mononuclear cells (lane 1), granulocytes (lane 2), MM-12 cells (lane 3), and IM-9 cells (lane 4), was amplified by RT-PCR for HGF, using GAPDH as a quantitative control, and then amplified cDNA was electrophoresed. Upper panel, Total RNA was extracted from human gingival fibroblasts, mononuclear cells, granulocytes, or granulocytes treated with 10% FCS for 20 min, and mRNA levels of HGF and GAPDH were quantitatively determined by real-time RT-PCR (lower panel). Levels of HGF were expressed as the ratio of cycles at thresfold for HGF/GAPDH. D, Granulocytes (5.1 × 106 cells/ml) or mononuclear cells (3.4 × 106 cells/ml) were incubated in RPMI 1640 for 1.5 h 37°C with 10% FCS, 10 μg/ml cycloheximide (CHX) in 10% FCS, 10 μg/ml or brefeldin A (BFA) in 10%FCS, and HGF released into the supernatant was measured as above (n = 3 ± SD). ∗, p < 0.001 vs FCS. To examine whether the mature HGF on granulocyte surface is derived from the endogenous products, we performed RT-PCR analysis for HGF mRNA in granulocytes from normal human blood. Whereas RT-PCR detected HGF mRNA in granulocytes, the expression of HGF was significantly lower than that in MM-12 cells (Fig. 2⇑C). MM-12 cells were established as fibroblasts expressing low level of HGF and produced only 80 pg/ml HGF into culture supernatant with confluent cell culture in 48 h, as opposed to 1000–3000 pg/ml HGF production by stromal cells from bone marrow or dental pulp fibroblasts with the same culture condition (9, 39). Furthermore, we quantitatively determined mRNA levels of HGF by real-time RT-PCR. Compared with the HGF level in gingival fibroblasts, the HGF level in granulocytes was less than one-tenth, even though granulocytes were treated with FCS (Fig. 2⇑C). Considering that granulocytes were able to release 900 pg/ml HGF in 1.5 h in the presence of 90% FCS (Fig. 1⇑E), it seems likely that most of the HGF on granulocyte surface is exogenously derived. Moreover, we examined the effects of cycloheximide and brefeldin A on HGF release from granulocytes and mononuclear cells in the presence of 10% FCS. Cycloheximide, a protein synthesis inhibitor, had no effect on FCS-stimulated release of HGF in the medium of granulocytes and mononuclear cells, indicating that new protein synthesis is not required for the HGF release. Furthermore, brefeldin A, an inhibitor of intracellular translocation from ER to Golgi, caused only a partial block of HGF release from the cells (Fig. 2⇑D). We next compared the effects of human serum and FCS on HGF release from human granulocytes. Fig. 3⇓A shows that human serum induced HGF release as well as FCS. To examine whether blood clotting is related to the HGF-releasing activity of serum, we incubated human granulocytes with serum and plasma prepared from the same human subject, and measured the released HGF levels in the medium. Granulocytes in 10% serum released 7-fold more HGF than those in 10% plasma, taking into account that internal HGF levels in the human plasma and in the serum were 243 and 265 pg/ml, respectively (Fig. 3⇓B). These observations indicated that blood coagulation is associated with the HGF-releasing activity of serum. Blood coagulation and HGF release from granulocytes. A, Human granulocytes (1.3 × 106 cells/ml) were incubated with 10% normal human serum (•) or 10% FCS (○), and the amount of HGF in the medium was measured by ELISA (n = 3). B, Human granulocytes (1.5 × 106 cells/ml) were incubated with 10% human serum or 10% plasma in RPMI 1640, or RPMI 1640 alone for 1.5 h at 37°C. The concentration of HGF in 10% human serum, 10% plasma, or the culture supernatant was measured as above (n = 3 ± SD). C, Human granulocytes (1.5 × 106 cells/ml) were incubated with 10% human serum, or antithrombin-treated plasma for 1.5 h at 37°C, and the HGF concentration in the supernatant was measured as above. (n = 3 ± SD). D, Human granulocytes (1.5 × 106 cells/ml) were incubated with 10% human serum, 10% plasma treated with 10 mM EDTA, or 10% plasma treated with 10 mM DX9065a (DXa) in the presence (▪) or absence (□) of 10 mM DXa for 1.5 h at 37°C. Human granulocytes (1.5 × 106 cells/ml) were incubated with 10 μg/ml fXa in RPMI 1640 or 10% human serum with addition of 10 μg/ml fXa. The concentration of HGF in the culture supernatant was measured as above (n = 3 ± SD). E, Human granulocytes (1.5 × 106 cells/ml) were incubated with 10 μg/ml fXa, 10 μg/ml fVa, or 10 μg/ml fXa + 10 μg/ml fVa in the presence or absence of 10 mM DX9065a for 1.5 h at 37°C. The concentration of HGF in the culture supernatant was measured as above (n = 3± SD). F, Thromboplastin at the dose of 40 mg/kg mice weight or PBS(−) were i.v. injected into mice, which were pretreated with DX9065a at the dose of 30 mg/kg or PBS(−). Human granulocytes (1 × 107 cells/kg mice weight) were injected into the mice at 2 h postinjection of thromboplastin. At 1.5 h after granulocytes injection, plasma was prepared with sodium citrate from each mice and human HGF concentration was measured by ELISA. (n = 4 or 5 ± SD). To examine whether the activation of coagulation factors is associated with HGF release from granulocytes, we prepared human plasma with antithrombin, which primarily inhibits factors Xa, IXa, and IIa. The antithrombin-treated plasma did not increase HGF release compared with human serum (Fig. 3⇑C). To examine the effect of fXa on HGF release more precisely, we prepared plasma with a specific inhibitor of Xa, DX9065a (40). As shown in Fig. 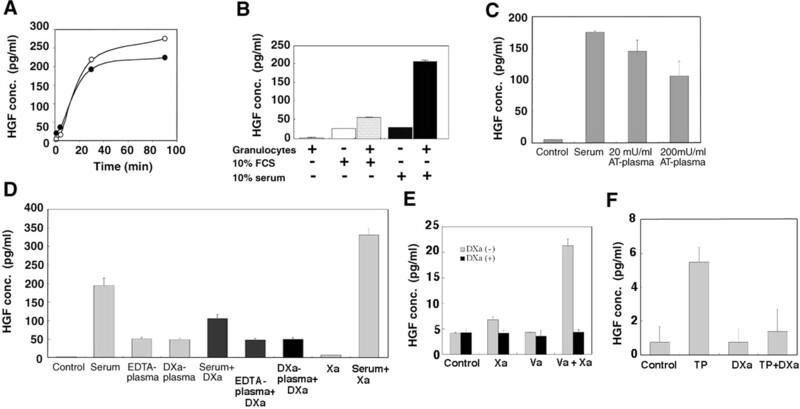 3⇑D, DX9065a-treated plasma did not induce HGF release, indicating that fXa activation is associated with HGF release from granulocytes. Interestingly, an addition of fXa enhanced serum-mediated HGF release from granulocytes, while fXa alone did not directly induce HGF release (Fig. 3⇑E). Considering these results, it was presumed that fXa induced HGF release in combination with some other molecule(s) in serum. Fig. 3⇑E demonstrated that fXa and fVa mixture significantly increased HGF release from granulocytes, whereas a single administration of either Xa or Va scarcely affected on HGF release. Furthermore, DX9065a inhibited HGF release from granulocytes in the presence of Xa and Va. These results indicated that fVa may function as a cofactor for fXa to release HGF from granulocytes. We next examined whether activation of the coagulation cascade induces the HGF release from human granulocytes in vivo. Thromboplastin initiates the extrinsic pathway of coagulation through the induction of factor VII binding to factors IX and X (41), and its injection into rodents is reported to cause activation of the coagulation cascade (42). Therefore, we transplanted human granulocytes into mice treated with thromboplastin, and determined human HGF concentrations in mouse blood. Fig. 3⇑F showed that human HGF release from granulocytes was increased by the treatment of mice with thromboplastin, whereas thromboplastin alone did not induce HGF release from granulocytes in vitro (data not shown). Furthermore, DX9065a pretreatment significantly decreased human HGF levels in the plasma from the thromboplastin-treated mice (Fig. 3⇑F), indicating that the activity of fXa is involved in thromboplastin-induced HGF release from human granulocytes in vivo. A previous report indicated that neutrophils secrete mature HGF by treatment with degranulating agents such as fMLP and PMA (23). Thus, we tested whether pretreatment with degranulating agents affects mature HGF release by FCS. Treatment of granulocytes with degranulating agents alone induced much less HGF release than FCS (Fig. 4⇓A). As neutrophils store HGF in the pro-HGF form (23), we then sought to detect pro-HGF in the medium of degranulating granulocytes. As our ELISA system detects only the mature HGF, we incubated the medium of fMLP-treated granulocytes with FCS to convert pro-HGF to mature HGF. Although a small amount of pro-HGF is found in the medium of fMLP-treated granulocytes, the combined amounts of pro- and mature HGF is still significantly less than the HGF in the medium of FCS-treated granulocytes (Fig. 4⇓B). Thus, most of the HGF released from granulocytes by FCS is not through degranulation. Degranulation and HGF release from human granulocytes. A, Human granulocytes (1.2 × 106 cells/ml) were incubated for 1.5 h at 37°C in RPMI 1640 containing 100 ng/ml PMA, 10−6 M fMLP or 10% FCS, and HGF released into the supernatant was measured by ELISA (n = 3 ± SD). B, Human granulocytes (1.2 × 106 cells/ml) were incubated for 1.5 h at 37°C in RPMI 1640 containing 10−6 M fMLP or 10% FCS, pelleted, and the supernatant was further incubated for 1 h at 37°C degree with or without 10% FCS. HGF concentration in the supernatants was measured as above (n = 3 ± SD). To explore the subcellular localization of mature HGF, we stained granulocytes with the polyclonal anti-HGF Ab that recognizes only the mature form of HGF. 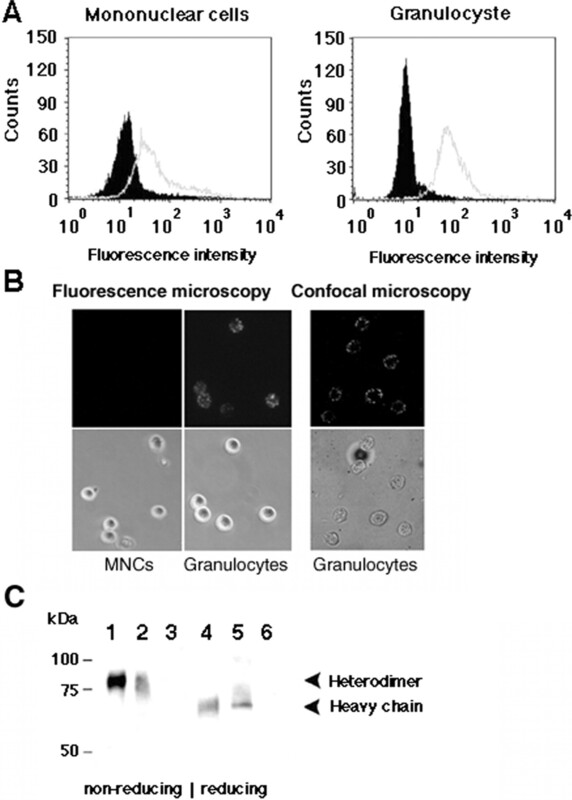 The mature HGF signal was detected on the surface of granulocytes by flow cytometry analysis (Fig. 5⇓A). HGF on the cell surface of mononuclear cells was significantly less. Immunohistochemical staining with anti-HGF Ab verified the association of HGF on granulocytes. Furthermore, confocal microscopy viewing indicated that mature HGF was localized on plasma membrane (Fig. 5⇓B). We next isolated the plasma membrane fraction of granulocytes, and performed immunoblotting with anti-HGF Abs. The heterodimeric mature form and the H chain of HGF were detected under nonreducing and reducing conditions, respectively, indicating that mature HGF is associated with plasma membranes of granulocytes (Fig. 5⇓C). Mature HGF is localized on the cell surface of human granulocytes and mononuclear cells. A, Human granulocytes and mononuclear cells were incubated with Ab to HGF (open histogram) or with rabbit IgG (filled histogram), and analyzed by flow cytometry. B, Fluorescence microscopic images of granulocytes and mononuclear cells immunostained with anti-HGF Ab. Upper panels, Dark field images; lower panels, bright field images. Upper right panel, A confocal dark image of granulocytes. C, The plasma membrane fraction was isolated from extracts of granulocytes (2 × 107 cells) by sucrose gradient centrifugation. A total of 400 pg (lane 1) or 100 pg (lane 4) of mature HGF, 250 μg of protein samples of the membrane fraction (lanes 2 and 5) or 2 mg of protein samples (lanes 3 and 6) of the nonmembranous fraction were loaded onto SDS-PAGE under the nonreducing (lanes 1–3) or reducing condition (lanes 4–6). Immunoblotting was performed with anti-HGF polyclonal (lanes 1–3) or monoclonal (lanes 4–6) Ab. As HGF on peripheral granulocytes was presumed to be exogenously derived, we next examined the binding capacity of exogenously added HGF to granulocytes. By adding 125I-labeled iodo-mature-HGF to cells, we calculated the HGF-binding activity of granulocytes to be 5-fold higher than that of mononuclear cells (Fig. 6⇓A). Furthermore, the specific binding of HGF to granulocytes was confirmed based on the effective competition by the addition of unlabeled HGF, whereas the observed HGF binding to mononuclear cells appeared nonspecific (Fig. 6⇓B). Binding of 125I-labeled iodo-HGF on human granulocytes. A, Human granulocytes (4.3 × 105 cells/300 μl) or mononuclear cells (4.3 × 105 cells/300 μl) were incubated with 125I-labeled iodo-HGF at 37°C for 1 h. The washed and cell-associated 125I-labeled iodo-HGF was measured as described in Materials and Methods. The values were indicated by the subtraction of nonspecific binding of 125I-labeled iodo-HGF. B, Human granulocytes (4.3 × 105 cells/100 μl) or mononuclear cells (4.3 × 105 cells/100 μl) were incubated with 125I-labeled iodo-HGF (7.1 × 104 cpm) of indicated radioactivity in the presence or absence of unlabeled HGF (1 μg/ml) at 37°C for 1 h. The washed and cell-associated 125I-labeled iodo-HGF was measured as described in Materials and Methods. The values were indicated by the subtraction of nonspecific binding of 125I-labeled iodo-HGF. C, Total RNA extracted from granulocytes (lane 1), mononuclear cells (lane 2), and fibroblasts from human dental pulp (lane 3) was amplified by RT-PCR for c-met, using GAPDH as a quantitative control. The HGF-binding affinity of granulocytes appeared much lower than the previously reported affinity of the HGF receptor, c-Met (43). Moreover, RT-PCR analysis showed that neither granulocytes nor mononuclear cells in peripheral blood express c-met (Fig. 6⇑C), which is consistent with the previously reported immunostaining data of c-Met on neutrophils (24). Thus, we conclude that granulocytes bind HGF not through c-Met. Oxygen radicals and NO are synthesized during ischemia and reperfusion injuries (44). Thus, we examined their effects on HGF release from granulocytes. We added a NO donor, DEA-NONOate, or its negative control, sulfo-NONOate, to human granulocytes in the presence of various concentrations of FCS, and measured the released HGF. Although treatment with 100 μM DEA-NONOate alone did not induce HGF release, it enhanced FCS-mediated HGF release from granulocytes compared with negative controls (Fig. 7⇓A). This was not due to the cytotoxic effect of DEA-NONOate, as the cell viability was not affected (Table II⇓). 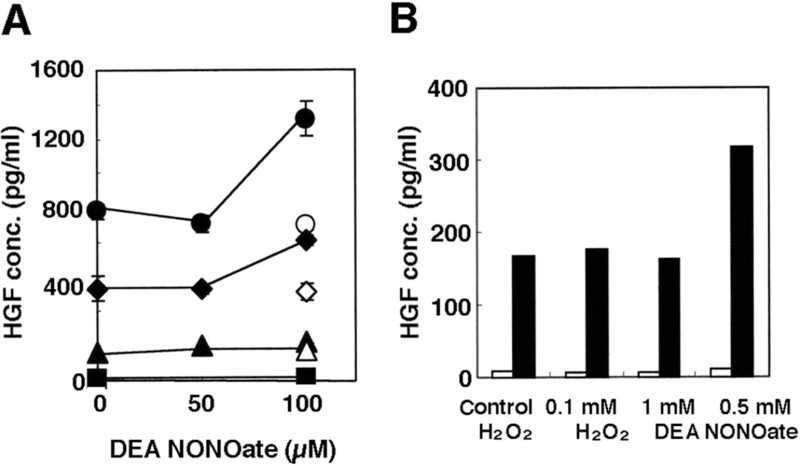 In contrast, 1 mM hydrogen peroxide did not affect HGF release from human granulocytes (Fig. 7⇓B). These data suggest that NO enhances HGF release from granulocytes. 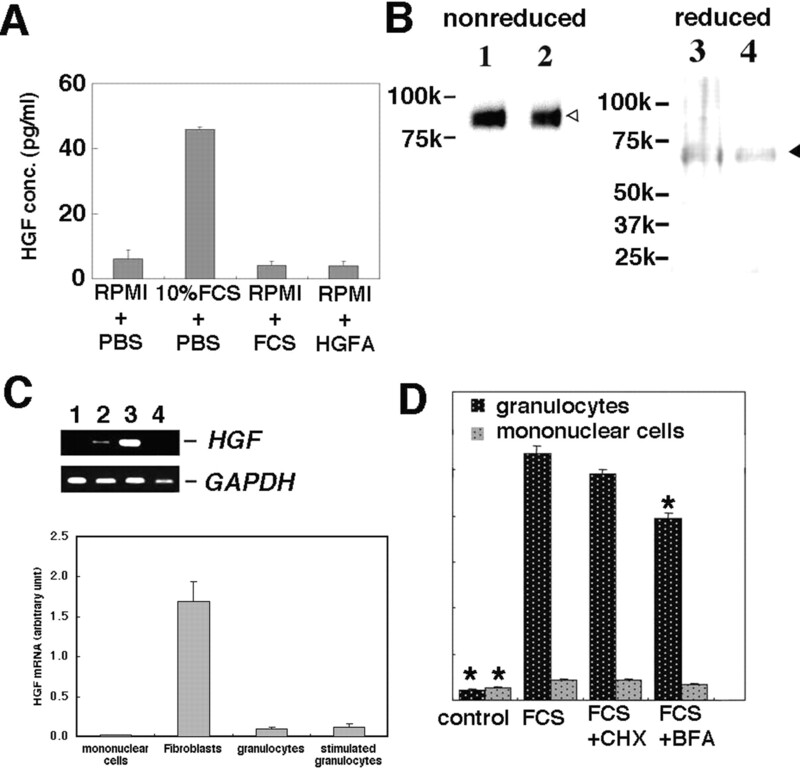 NO enhanced HGF release from granulocytes. A, Granulocytes (1.5 × 106 cells/ml) were incubated in RPMI 1640 containing 0% (square), 10% (triangle), 50% (diamond), or 90% (circle) of FCS. Cells were also incubated with DEA-NONOate (closed symbols) or sulfo-NONOate (open symbols) as a negative control. The amount of released HGF was measured by ELISA as above. (n = 3 ± SD). B, The effect of H2O2 on HGF release from granulocytes. Granulocytes (1.5 × 106 cells/ml) were incubated in RPMI 1640 containing 0% (□) or 10% (▪) FCS, in the presence of DEA-NONOate or H2O2 at 37°C for 90 min. After centrifugation, HGF contents in the supernatants were determined by ELISA (n = 3). We previously developed a high sensitivity sandwich ELISA for mature-HGF, which permitted the precise measurement of mature HGF levels in human serum (25). Using this assay, we found that HGF concentrations in sera from normal subjects correlated with the number of leukocytes in peripheral blood. In the present study, we have shown that mature HGF is present on human granulocytes and both FCS and normal human serum induced the release of HGF from human granulocytes. Blood coagulation seems to be related to the HGF-releasing activity of serum. Because the number of granulocytes in peripheral blood from normal human adults is within the range of 1.8–6.6 × 106 cells/ml (45), our data suggest that the amount of HGF that can be released from granulocytes would be 0.95–6.3 ng/ml: 4- to 27-fold higher than the HGF concentration in serum from normal subjects (46). The induction of HGF release by FCS occurred as fast as within 20 min (Fig. 1⇑C). We also found that FCS stimulation did not affect the level of HGF mRNA (Fig. 2⇑C). These findings strongly indicated that the increased HGF release is not through transcriptional activation. It has recently been reported that human neutrophils store HGF in the secretary vesicles and gelatinase-specific granules and secrete HGF by degranulation (23). In this present study, we confirmed that two degranulating agents, fMLP and PMA released pro-HGF which was converted into mature HGF by FCS (Fig. 4⇑B). However, significantly more HGF was released from granulocytes by FCS stimulation, strongly indicating that serum-mediated HGF release is mostly not through degranulation. Our present data demonstrated that a significant amount of HGF constitutively exists on the cell surface of granulocytes prepared without treatment of serum (Fig. 5⇑, A and B). As human granulocytes do not express c-Met (Fig. 6⇑C), the molecular identity of the HGF-binding factor(s) on the surface of granulocytes is currently not clear. As HGF is a heparin-binding protein (47), one possible candidate is heparin. However, the addition of heparin did not displace HGF from the surface of granulocytes (data not shown). Furthermore, digestion of heparin on the cell surface by heparitinases did not affect HGF release from granulocytes (data not shown). These observations suggest that heparin does not mediate HGF binding to granulocytes. Besides a heparin-binding domain, HGF also contains kringle domains, which is characterized by a “triple loop, 3-disulfide bridge structure”. Kringle domains are found throughout the blood clotting and fibrinolytic proteins, and are believed to play a role in binding mediators (48, 49, 50). Some kringle domain-containing molecules were reported to interact with molecules on the neutrophil surface to induce biological activity (51, 52). Furthermore, we found that the addition of three kringle domain-containing proteins (plasminogen, HGFA, and thrombin) slightly increase HGF release from granulocytes (T. Ohnishi and T. Matsuguchi, unpublished observations). We presume that HGF may bind neutrophil surface through its kringle domains. The detailed binding mechanisms, however, need further examination. HGF is expressed in embryonic mouse liver at gestation day 12 (53, 54). Murine bone marrow in long-term cultures express HGF mRNA (39, 53, 55). However, HGF is only synthesized by limited types of hemopoietic cells, such as cells from patients with multiple myeloma (56). Our present data showed that minimal amounts of HGF mRNA were expressed by granulocytes from human peripheral blood. In contrast, stromal cells in bone marrow are predominant producers of HGF (55). Other mesenchymal cells such as fibroblasts are also dominant producers of HGF in various organs (6). Thus, one possible mechanism by which granulocytes acquire HGF on their surface is the recruitment of HGF secreted from mesenchymal cells such as bone marrow stromal cells. Interestingly, plasma HGF level in human bone marrow was reported to be 0.92 ng/ml, which is ∼4-fold higher than that in normal blood serum (25, 57). Neutrophils may acquire surface HGF in bone marrow where they differentiate from hemopoietic stem cells. Increases of serum HGF has been reported in diseases such as fulminant hepatic failure, pancreatitis, and multiple myeloma, in which high HGF levels are caused by the increased production (12, 15, 16). In contrast, concentrations of HGF in sera are rapidly elevated in acute myocardial infarction within 3 h after onset of chest pain (18), or within 60 min after arterial thrombosis (58). Consistently, in a rat model of myocardial ischemia and reperfusion, the increase of serum HGF is very swift (19). Because the serum levels of HGF reach the maximum long before the peaks of HGF mRNA, the rapid elevation of serum HGF levels in these ischemic diseases are not likely to require new protein synthesis. Acute myocardial infarction is frequently induced by thrombosis at the site of atherosclerosis plaque disruption. Especially, tissue factor contributes to this thrombus formation (59). In this study, we found that fXa enhanced HGF release from granulocytes. Considering that the tissue factor is able to convert fX to fXa, fXa is presumed to increase HGF release from granulocytes in atherosclerotic lesions. Notably, HGF has four kringle domains, and fXa has been reported to react with the first kringle domain-containing HGF variant, NK1 (60, 61). Furthermore, ischemia/reperfusion injury such as myocardial infarction is known to cause generation of free radicals including superoxide and NO (44). In this study we also found that NO enhance HGF release from granulocytes. These observations strongly suggested that HGF was released from granulocytes at the site of ischemia injury. Being consistent with our present findings, a recent report implied the correlation of blood coagulation with increased blood HGF levels. Acute myelocytic leukemia is associated with bleeding tendency due to disseminated intravascular coagulation, and serum levels of HGF in patients with acute myelocytic leukemia correlated with the presence of disseminated intravascular coagulation (62). In this connection, HGF level is reported to be elevated in sera during incubation of whole blood at room temperature in the absence of anticoagulants, and HGF level in sera from normal human subjects is shown to be 19% higher than that in plasma (62). Blood coagulation is initiated by the activation of a cascade of coagulation factors, most of which are serine proteases called zymogens (63). Thrombin among the serine proteases is involved in activation of HGF, because HGFA is converted to active form through cleavage by thrombin (37). Therefore, it is possible that the increase of HGF in granulocyte medium by fXa is caused by digestion of pro-HGF with HGFA which was activated by thrombin. 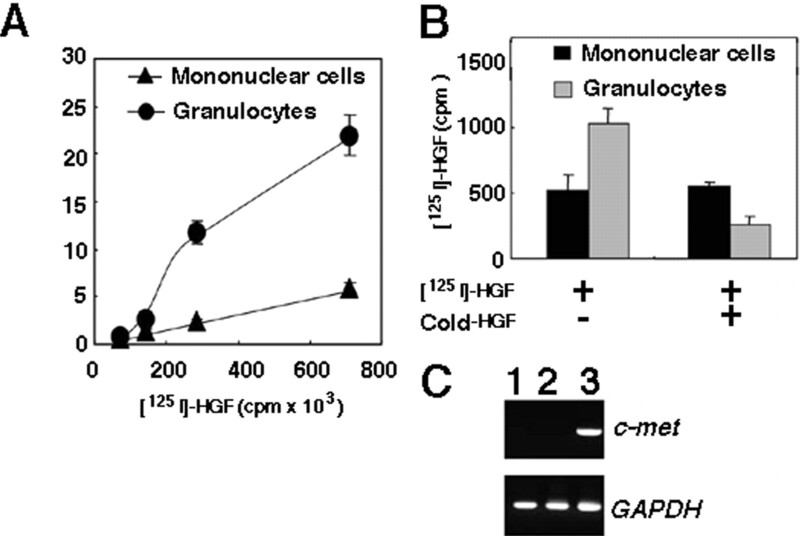 However, HGFA did not increase HGF concentration in the medium of granulocytes (Fig. 2⇑A), suggesting that HGFA is not involved in the increase of HGF in the medium. Our data indicated fXa requires other factor(s) to induce HGF release. It has previously demonstrated that fXa interacts with fVa and phospholipid to enhance the prothrombinase activity of thrombin (64). Therefore, it is reasonable to presume the assembly of fVa and fXa is formed on the plasma membrane of granulocytes. In fact, this speculation is consistent with our observation that fVa enhanced HGF release from granulocytes in combination with fXa. In contrast, prothrombin, another candidate for the cofactor, and its derivatives did not affect HGF release from granulocytes (data not shown). However, it should be noted that the increase of HGF release by fXa and fVa was limited compared with serum stimulation. Thus, it is possible that HGF release from granulocytes is mediated by digested substrates of fXa other than prothrombin. In summary, our present data suggest that HGF release from the surface of granulocytes may contribute to the rapid increase of serum HGF levels. This release appears to be induced by the blood coagulation process, indicating it may have clinical significance in the prognosis of ischemic diseases such as acute myocardial infarction and arterial occlusive diseases. We propose that granulocytes deliver mature HGF to sites of ischemic injury, where the released mature HGF stimulates the process of tissue repair, including increased angiogenesis and epithelial cell proliferation. We thank Dr. Takayasu Nagahara (Daiichi Pharmaceutical) for providing DX9065a, and Goichiro Yoshida (National Institute of Fitness and Sports in Kanoya, Kanoya, Japan) for technical assistance. ↵1 This work was supported in part by Grants-in Aid for Scientific Research (C) 14571767, and Grant-in-Aid for Scientific Research (B), 17390496, from the Japan Society for Promotion of Science. This work was also supported in part by the Ministry of Education, Science, Sports and Culture, Grant-in-Aid for Scientific Research (B), 17390496 (to T.M.). ↵3 Abbreviations used in this paper: HGF, hepatocyte growth factor; fXa, factor Xa; DEA-NONOate, diethylammonium (Z)-1-(N,N-diethylamino)diazen-1-ium-1,2-diolate; Sulfo-NONOate, disodium (E)-1-sulfonatodiazen-1-ium-1,2-diolate; HGFA, HGF activator; fVa, factor Va; Tβ4, thymosin β4. Rosen, E. M., S. K. Nigam, I. D. Goldberg. 1994. Scatter factor and the c-met receptor: a paradigm for mesenchymal/epithelial interaction. J. Cell Biol. 127: 1783-1787. Michalopoulos, G. K., M. C. DeFrances. 1997. Liver regeneration. Science 276: 60-66. Trusolino, L., L. Pugliese, P. M. Comoglio. 1998. Interactions between scatter factors and their receptors: hints for therapeutic applications. FASEB J. 12: 1267-1280. Tsubouchi, H.. 1999. Hepatocyte growth factor for liver disease. Hepatology 30: 333-334. Birchmeier, C., H. Brohmann. 2000. Genes that control the development of migrating muscle precursor cells. Curr. Opin. Cell Biol. 12: 725-730. Ohnishi, T., Y. Daikuhara. 2003. Hepatocyte growth factor/scatter factor in development, inflammation and carcinogenesis: its expression and role in oral tissues. Arch. Oral Biol. 48: 797-804. Tamura, M., N. Arakaki, H. Tsubouchi, H. Takada, Y. Daikuhara. 1993. Enhancement of human hepatocyte growth factor production by interleukin- 1α and -1β and tumor necrosis factor-α by fibroblasts in culture. J. Biol. Chem. 268: 8140-8145. Matsunaga, T., E. Gohda, T. Takebe, Y. L. Wu, M. Iwao, H. Kataoka, I. Yamamoto. 1994. Expression of hepatocyte growth factor is up-regulated through activation of a cAMP-mediated pathway. Exp. Cell Res. 210: 326-335. Ohnishi, T., M. Suwa, T. Oyama, N. Arakaki, M. Torii, Y. Daikuhara. 2000. Prostaglandin E2 predominantly induces production of hepatocyte growth factor/scatter factor in human dental pulp in acute inflammation. J. Dent. Res. 79: 748-755. Grant, D. S., H. K. Kleinman, I. D. Goldberg, M. M. Bhargava, B. J. Nickoloff, J. L. Kinsella, P. Polverini, E. M. Rosen. 1993. Scatter factor induces blood vessel formation in vivo. Proc. Natl. Acad. Sci. USA 90: 1937-1941. Taniyama, Y., R. Morishita, M. Aoki, H. Nakagami, K. Yamamoto, K. Yamazaki, K. Matsumoto, T. Nakamura, Y. Kaneda, T. Ogihara. 2001. Therapeutic angiogenesis induced by human hepatocyte growth factor gene in rat and rabbit hindlimb ischemia models: preclinical study for treatment of peripheral arterial disease. Gene Ther. 8: 181-189. Tsubouchi, H., Y. Niitani, S. Hirono, H. Nakayama, E. Gohda, N. Arakaki, O. Sakiyama, K. Takahashi, M. Kimoto, S. Kawakami, et al 1991. Levels of the human hepatocyte growth factor in serum of patients with various liver diseases determined by an enzyme-linked immunosorbent assay. Hepatology 13: 1-5. Kawakami, S., H. Tsubouchi, S. Nakagawa, S. Hirono, N. Arakaki, O. Nakamura, Y. Daikuhara, T. Arima. 1994. Expression of hepatocyte growth factor in normal and carbon tetrachloride-treated monkeys. Hepatology 20: 1255-1260. Yanagita, K., K. Matsumoto, K. Sekiguchi, H. Ishibashi, Y. Niho, T. Nakamura. 1993. Hepatocyte growth factor may act as a pulmotrophic factor on lung regeneration after acute lung injury. J. Biol. Chem. 268: 21212-21217. Ueda, T., Y. Takeyama, A. Toyokawa, S. Kishida, M. Yamamoto, Y. Saitoh. 1996. Significant elevation of serum human hepatocyte growth factor levels in patients with acute pancreatitis. Pancreas 12: 76-83. Seidel, C., M. Bourset, I. Turesson, N. Abildgaard, A. Sundan, A. Waage. 1998. Elevated serum concentrations of hepatocyte growth factor in patients with multiple myeloma: the Nordic Myeloma Study Group. Blood 91: 806-812. Beppu, K., A. Uchiyama, T. Morisaki, K. Nakamura, H. Noshiro, K. Matsumoto, T. Nakamura, M. Tanaka, M. Katano. 2000. Elevation of serum hepatocyte growth factor concentration in patients with gastric cancer is mediated by production from tumor tissue. Anticancer Res. 20: 1263-1267. Matsumori, A., Y. Furukawa, T. Hashimoto, K. Ono, T. Shioi, M. Okada, A. Iwasaki, R. Nishio, S. Sasayama. 1996. Increased circulating hepatocyte growth factor in the early stage of acute myocardial infarction. Biochem. Biophys. Res. Commun. 221: 391-395. Ono, K., A. Matsumori, T. Shioi, Y. Furukawa, S. Sasayama. 1997. Enhanced expression of hepatocyte growth factor/c-Met by myocardial ischemia and reperfusion in a rat model. Circulation 95: 2552-2558. Matsumori, A., S. Miyazaki, H. Takano, K. Ono, M. Okada, T. Miyamoto, H. Nonogi, S. Daikoku, K. Mitsudo, Y. Matsunaga, et al 2000. Circulating hepatocyte growth factor as a marker of thrombus formation in unstable angina pectoris. Jpn. Circ. J. 64: 805-807. Yoshitomi, Y., S. Kojima, T. Umemoto, K. Kubo, Y. Matsumoto, M. Yano, T. Sugi, M. Kuramochi. 1999. Serum hepatocyte growth factor in patients with peripheral arterial occlusive disease. J. Clin. Endocrinol. Metab. 84: 2425-2428. Soeki, T., Y. Tamura, H. Shinohara, H. Tanaka, K. Bando, N. Fukuda. 2000. Serial changes in serum VEGF and HGF in patients with acute myocardial infarction. Cardiology 93: 168-174. Grenier, A., S. Chollet-Martin, B. Crestani, C. Delarche, J. El Benna, A. Boutten, V. Andrieu, G. Durand, M. A. Gougerot-Pocidalo, M. Aubier, M. Dehoux. 2002. Presence of a mobilizable intracellular pool of hepatocyte growth factor in human polymorphonuclear neutrophils. Blood 99: 2997-3004. Wislez, M., N. Rabbe, J. Marchal, B. Milleron, B. Crestani, C. Mayaud, M. Antoine, P. Soler, J. Cadranel. 2003. Hepatocyte growth factor production by neutrophils infiltrating bronchioloalveolar subtype pulmonary adenocarcinoma: role in tumor progression and death. Cancer Res. 63: 1405-1412. Ohnishi, T., K. Kakimoto, S. Hashida, M. Fujii, S. Hirono, K. Nishiyama, Y. Amita, E. Ishikawa, H. Tsubouchi, Y. Daikuhara. 2000. Development of highly sensitive enzyme-linked immunosorbent assays for hepatocyte growth factor/scatter factor (HGF/SF): determination of HGF/SF in serum and urine from normal human subjects. J. Immunol. Methods 244: 163-173. Kajihara, T., T. Ohnishi, N. Arakaki, I. Semba, Y. Daikuhara. 1999. Expression of hepatocyte growth factor/scatter factor and c-Met in human dental papilla and fibroblasts from dental papilla. Arch. Oral Biol. 44: 135-147. Arakaki, N., S. Kawakami, O. Nakamura, T. Ohnishi, H. Miyazaki, T. Ishii, H. Tsubouchi, Y. Daikuhara. 1995. Evidence for the presence of an inactive precursor of human hepatocyte growth factor in plasma and sera of patients with liver diseases. Hepatology 22: 1728-1734. Sugawara, S., A. Sugiyama, E. Nemoto, H. Rikiishi, H. Takada. 1998. Heterogeneous expression and release of CD14 by human gingival fibroblasts: characterization and CD14-mediated interleukin-8 secretion in response to lipopolysaccharide. Infect. Immun. 66: 3043-3049. Kanof, M. E., P. D. Smith. 1991. Immunologic studies in humans. J. E. Coligan, and A. D. Kruisbeek, and D. H. Marguiles, and E. M. Shevach, and W. Strober, eds. Current Protocols in Immunology 7.0.1 Wiley, New York. Harlan, J. M., P. D. Killen, F. M. Senecal, B. R. Schwartz, E. K. Yee, R. F. Taylor, P. G. Beatty, T. H. Price, H. D. Ochs. 1985. The role of neutrophil membrane glycoprotein GP-150 in neutrophil adherence to endothelium in vitro. Blood 66: 167-178. Gohda, E., H. Tsubouchi, H. Nakayama, S. Hirono, O. Sakiyama, K. Takahashi, H. Miyazaki, S. Hashimoto, Y. Daikuhara. 1988. Purification and partial characterization of hepatocyte growth factor from plasma of a patient with fulminant hepatic failure. J. Clin. Invest. 81: 414-419. Misra, D. N., T. J. Gill, III, L. W. Estes. 1974. Lymphocyte plasma membranes. II. Cytochemical localization of 5′-nucleotidase in rat lymphocytes. Biochim. Biophys. Acta 352: 455-461. Morre, D. J.. 1974. Isolation of Golgi apparatus. Methods Enzymol. 31: 130-148. Hunter, W. M., F. C. Greenwood. 1962. Preparation of iodine-131 labelled human growth hormone of high specific activity. Nature 194: 495-496. Ohnishi, T., O. Nakamura, N. Arakaki, Y. Daikuhara. 1997. Effect of phosphorylated rat fetuin on the growth of hepatocytes in primary culture in the presence of human hepatocyte-growth factor: evidence that phosphorylated fetuin is a natural modulator of hepatocyte-growth factor. Eur. J. Biochem. 243: 753-761. Oishi, K., K. Machida. 1997. Inhibition of neutrophil apoptosis by antioxidants in culture medium. Scand. J. Immunol. 45: 21-27. Miyazawa, K., T. Shimomura, N. Kitamura. 1996. Activation of hepatocyte growth factor in the injured tissues is mediated by hepatocyte growth factor activator. J. Biol. Chem. 271: 3615-3618. Oh, I. S., S. S. So, K. Y. Jahng, H. G. Kim. 2002. Hepatocyte growth factor upregulates thymosin β4 in human umbilical vein endothelial cells. Biochem. Biophys. Res. Commun. 296: 401-405. Takai, K., J. Hara, K. Matsumoto, G. Hosoi, Y. Osugi, A. Tawa, S. Okada, T. Nakamura. 1997. Hepatocyte growth factor is constitutively produced by human bone marrow stromal cells and indirectly promotes hematopoiesis. Blood 89: 1560-1565. Hara, T., A. Yokoyama, H. Ishihara, Y. Yokoyama, T. Nagahara, M. Iwamoto. 1994. DX-9065a, a new synthetic, potent anticoagulant and selective inhibitor for factor Xa. Thromb. Haemost. 71: 314-319. Broze, G. J., Jr. 1995. Tissue factor pathway inhibitor and the revised theory of coagulation. Annu. Rev. Med. 46: 103-112. Hetland, O., B. Johnsen, T. L. Janson, H. Prydz. 1983. Intravenous injections of tissue thromboplastin and phospholipase C in rabbits. Scand. J. Clin. Lab Invest. 43: 35-40. Bottaro, D. P., J. S. Rubin, D. L. Faletto, A. M. Chan, T. E. Kmiecik, G. F. Vande Woude, S. A. Aaronson. 1991. Identification of the hepatocyte growth factor receptor as the c-met proto-oncogene product. Science 251: 802-804. Wang, P., J. L. Zweier. 1996. Measurement of nitric oxide and peroxynitrite generation in the postischemic heart: evidence for peroxynitrite-mediated reperfusion injury. J. Biol. Chem. 271: 29223-29230. Lentner, C.. 1981. Geigy Scientific Tables Ciba-Geigy Limited, Basel, Switzerland. Toi, M., T. Taniguchi, T. Ueno, M. Asano, N. Funata, K. Sekiguchi, H. Iwanari, T. Tominaga. 1998. Significance of circulating hepatocyte growth factor level as a prognostic indicator in primary breast cancer. Clin. Cancer Res. 4: 659-664. Aoyama, H., D. Naka, Y. Yoshiyama, T. Ishii, J. Kondo, M. Mitsuka, T. Hayase. 1997. Isolation and conformational analysis of fragment peptide corresponding to the heparin-binding site of hepatocyte growth factor. Biochemistry 36: 10286-10291. Huby, T., J. Chapman, J. Thillet. 1997. Pathophysiological implication of the structural domains of lipoprotein(a). Atherosclerosis 133: 1-6. Kim, T. H., E. Kim, D. Yoon, J. Kim, T. Y. Rhim, S. S. Kim. 2002. Recombinant human prothrombin kringles have potent anti-angiogenic activities and inhibit Lewis lung carcinoma tumor growth and metastases. Angiogenesis 5: 191-201. Kim, J. S., J. H. Chang, H. K. Yu, J. H. Ahn, J. S. Yum, S. K. Lee, K. H. Jung, D. H. Park, Y. Yoon, S. M. Byun, S. I. Chung. 2003. Inhibition of angiogenesis and angiogenesis-dependent tumor growth by the cryptic kringle fragments of human apolipoprotein(a). J. Biol. Chem. 278: 29000-29008. Lamanuzzi, L. B., M. Mtairag, G. Pepe, E. Anglés-Cano. 2004. Neutrophils stimulated by apolipoprotein(a) generate fragments that are stronger inhibitors of plasmin formation than apo(a). Thromb. Haemost. 92: 1066-1075. Chavakis, T., A. Athanasopoulos, J. S. Rhee, V. Orlova, T. Schmidt-Wöll, A. Bierhaus, A. E. May, I. Celik, P. P. Nawroth, K. T. Preissner. 2005. Angiostatin is a novel anti-inflammatory factor by inhibiting leukocyte recruitment. Blood 105: 1036-1043. Nishino, T., H. Hisha, N. Nishino, M. Adachi, S. Ikehara. 1995. Hepatocyte growth factor as a hematopoietic regulator. Blood 85: 3093-3100. Selden, C., M. Jones, D. Wade, H. Hodgson. 1990. Hepatotropin mRNA expression in human foetal liver development and in liver regeneration. FEBS Lett. 270: 81-84. Weimar, I. S., N. Miranda, E. J. Muller, A. Hekman, J. M. Kerst, G. C. de Gast, W. R. Gerritsen. 1998. Hepatocyte growth factor/scatter factor (HGF/SF) is produced by human bone marrow stromal cells and promotes proliferation, adhesion and survival of human hematopoietic progenitor cells (CD34+). Exp. Hematol. 26: 885-894. Börset, M., H. Hjorth-Hansen, C. Seidel, A. Sundan, A. Waage. 1996. Hepatocyte growth factor and its receptor c-met in multiple myeloma. Blood 88: 3998-4004. Nakamura, S., E. Gohda, Y. Matsuo, I. Yamamoto, J. Minowada. 1994. Significant amount of hepatocyte growth factor detected in blood and bone marrow plasma of leukaemia patients. Br. J. Haematol. 87: 640-642. Matsumori, A., K. Ono, Y. Furukawa, M. Okada, S. Sasayama. 1998. Circulating hepatocyte growth factor as an early marker of arterial thrombus formation. Jpn. Circ. J. 62: 311-313. Ott, I.. 2003. Tissue factor in acute coronary syndromes. Semin. Vasc. Med. 3: 185-192. Taneda, H., K. Andoh, J. Nishioka, H. Takeya, K. Suzuki. 1994. Blood coagulation factor Xa interacts with a linear sequence of the kringle 2 domain of prothrombin. J. Biochem. 116: 589-597. Pediaditakis, P., S. P. Monga, W. M. Mars, G. K. Michalopoulos. 2002. Differential mitogenic effects of single chain hepatocyte growth factor (HGF)/scatter factor and HGF/NK1 following cleavage by factor Xa. J. Biol. Chem. 277: 14109-14115. Nayeri, F., L. Brudin, I. Nilsson, P. Forsberg. 2002. Sample handling and stability of hepatocyte growth factor in blood samples. Cytokine 19: 201-205. Neurath, H., K. A. Walsh. 1976. Role of proteolytic enzymes in biological regulation (a review). Proc. Natl. Acad. Sci. USA 73: 3825-3832. Hertzberg, M.. 1994. Biochemistry of factor X. Blood Rev. 8: 56-62.